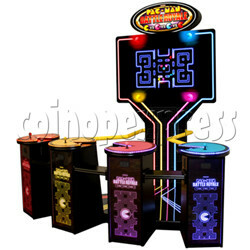 PacMan Battle Royale is an advanced upright cabinet for four players competitive arcade game from Pac-Man series released by Namco, features with a giant 55 inch high definition LCD screen and eye-catching colored lightings design. The original Pac-Man game concept has been given a cannibalistic twist: Eliminate your opponents by eating them and the last Pac-Man standing wins the round. When players eat a power pellet, they power-up by doubling in size and increasing in speed. Once powered up, they are now able to eat non powered-up blue players and ghosts. The Pac-Man game play is simple, competitive, and highly addictive.